This event is sold out. Stay tuned for updates on the livestream. 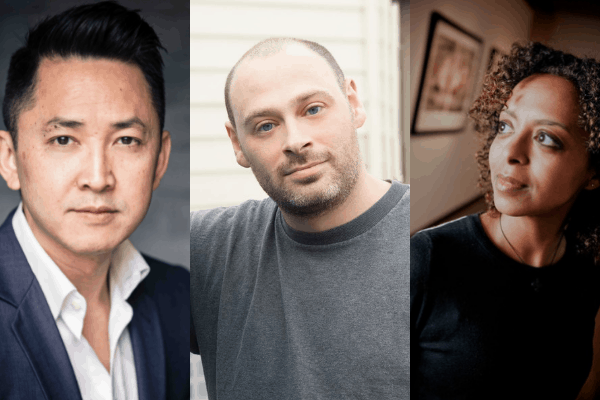 Pulitzer Prize-winning author Viet Thanh Nguyen (The Sympathizer), and authors Maaza Mengiste (Beneath the Lion’s Gaze) and Lev Golinkin (A Backpack, a Bear, and Eight Crates of Vodka) discuss the critically acclaimed anthology The Displaced: Refugee Writers on Refugee Lives. Edited by Viet Thanh Nguyen and featuring essays by Maaza Mengiste and Lev Golinkin, The Displaced collects the work of 17 refugee writers, painting intimate narratives of their everyday lives and reckoning with the largest refugee crisis in history, and the increasingly hostile conditions refugees face. Maaza Mengiste‘s debut novel, Beneath the Lion’s Gaze, was selected by The Guardian as one of the 10 best contemporary African books and named one of the best books of 2010 by Christian Science Monitor, Boston Globe, and other publications. A recipient of a 2018 fellowship from the National Endowment for the Arts, she is also a Fulbright Scholar, a Puterbaugh Fellow, and a runner-up for the Dayton Literary Peace Prize. Her work can be found in The New Yorker, New York Review of Books, Granta, The Guardian, The New York Times, Rolling Stone, and BBC, among other places. She was a writer on the documentary projects, Girl Rising and The Invisible City: Kakuma. Her second novel, The Shadow King, will be published in late 2019. Author photo credit Simon Hurst. Lev Golinkin is the author of A Backpack, a Bear, and Eight Crates of Vodka, Amazon’s Debut of the Month, a Barnes & Noble’s Discover Great New Writers program selection, and winner of the Premio Salerno Libro d’Europa. Mr. Golinkin, a graduate of Boston College, came to the US as a child refugee from the eastern Ukrainian city of Kharkov (now called Kharkiv) in 1990. His writing on the Ukraine crisis, Russia, the far right, and immigrant and refugee identity has appeared in The New York Times, Washington Post, Los Angeles Times, CNN, The Boston Globe, Politico Europe, and Time.com, among others; he has been interviewed by MSNBC, NPR, ABC Radio, WSJ Live and HuffPost Live.